Even by Pakistan’s standards, where violence has routinely scarred the landscape, the scenes were startling. For several hours on Sunday, the heart of this eastern city was witness to street battles as baton-wielding police mounted a fierce but ultimately failed attempt to crush a gathering of anti-government lawyers and political activists. As the country’s enduring political confrontation entered its decisive phase, President Asif Ali Zardari pressed on with his crackdown on opposition groups in a bid to thwart a “long march” for the reinstatement of deposed Chief Justice Iftikhar Chaudhry. After hundreds of arrests and accusations of a media clampdown, police blocked off Lahore’s main thoroughfares as orders were reportedly issued to confine former Prime Minister Nawaz Sharif and other political leaders to house arrest. When it was all over, however, the Zardari government appeared to back down. Government officials have confirmed that an agreement has been reached to reinstate Chaudhry as Chief Justice, bringing to an apparent close the political crisis sparked by his ouster two years ago by former President Pervez Musharraf. 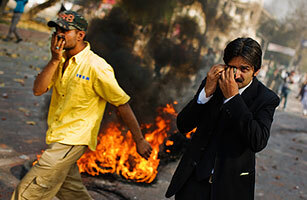 Later, arriving from the opposite direction, a group of liberal activist women clad in designer sunglasses held up placards demanding the “rule of law” and the “independence of the judiciary” as they chanted “Go, Zardari, go”  echoing the slogans used to taunt Musharraf in his final months. After persistent requests, the police allowed them to pass and join other demonstrators gathered in the square outside the red brick colonial-era Lahore High Court building. Black-suited lawyers arrived in scores, pumping fists in the air. The most boisterous contingent was that of the Jamaat-e-Islami, an Islamist party, whose members rumbled in aboard a blue truck. By noon, however, the crowd had only grown to some 500 people. The crackdown appeared to be working. “They set up barricades everywhere and had already arrested so many people,” said Atiya Khan, a member of the Concerned Citizens of Pakistan. “It was a herculean task just to get here.” At this point, the police had grown tired of beating the odd lawyer across the head and pushing others around. For reasons not obvious, given the modest numbers, they began firing tear gas canisters that whistled into the center of the crowd. The protesters fled in a panic, but could only go so far. All four avenues leading to the square were blocked. Some were prepared, pulling out moist towels, bottles of water and fistfuls of salt. The less fortunate ran into the court’s building. After a brief lull, the police fired further rounds. One lawyer swiftly picked up a canister and threw it back with surprisingly accurate aim, scattering the ranks of policemen. Another man tried to do the same, but instantly dropped the canister, his hand scalded. Thick white clouds shrouded much of the crowd, blinding people as the toxins filled their lungs. Some journalists found safety in their vans, but others were knocked down, choking as they fell to their knees. By this point, the crowd had been augmented by students and political activists unwilling to yield to the police a monopoly on the violence. Collecting stones from nearby, they began to pelt the policemen. The Mall road  where the city’s major hotels, provincial parliament, theaters and the British-built post office are situated  became the scene of an hour-long pitched battle. The bulk of the peaceful crowd had dispersed. In their place, plainclothes policemen and angry youths exchanged volleys of rocks. The tense scene was interrupted for a moment when a short and rotund policeman slipped and fell on his backside after hurling a large rock, triggering laughs from onlookers. Both sides eventually stepped back from each other, unable to sustain the exchange of violence any longer. Lahore had not witnessed such clashes in decades. “It’s really, really bad what the police are doing,” said lawyer Waqas Mohammed, 31. “This is supposed to be the city of beating hearts. It has been shut down by the government, which is attacking peaceful people.” Like other actions taken over the past week, the scene revived memories of Musharraf’s crackdown when he imposed a state of emergency in late 2007. In the grounds of the High Court, defiant lawyers chanted slogans for hours: “We will live, we will die, we will have a sit-down.” The plan was to march to Islamabad and sit in front of parliament until their demands were met. More than 12 hours later, they hadn’t even managed to leave the area. But events suddenly shifted in their favor. “We’ve won, we’ve won!” shouted a Sharif supporter, racing into a courtyard. Two of the city’s most senior police officers had resigned in protest. Minutes later, the deputy inspector general arrived to cheers. He mounted a stage to apologize for his actions, before being garlanded and held aloft by some of the same men who had been hurling stones at the police. Elsewhere in the city, barriers came tumbling down. Razor wire was cut. Cranes were used to lift containers out of the way and clear the main routes leading out of Lahore. Sharif left his home, spurning the lightly and reluctantly enforced police detention, and set out for Islamabad. Lawyer Aitzaz Ahsan had similar success, abandoning his home hours after being told that he was being placed under house arrest for three days  a fate he had suffered under Musharraf for five months. The crackdown had backfired. As a convoy of thousands of protesters destined for Islamabad rumbled on to the Grand Trunk Road, reports spread that the government had finally bowed to their demands.